It is a picture of Gothic splendour in black and white gone terribly wrong. Where once faithful men and women stood, only trenches of wood and scattered chairs remain. The apse and the alter stand defiantly against the destruction; a holy spectre in a silent church. This is one of the pictures I found in my grandfather’s papers in the basement. All are rolled tightly against time- only giving up their secrets with much tenderness and determination. I assume that they were issued to my great- grandfather- Colonel Thomas Bedell, who was in charge of a regiment during World War One. The church is Cambrai Cathedral- a building that had a long history of music and tragedy. The original Cathedral at Cambrai had been completed in 1274. It lasted until 1791, when it was converted to a grain store during the French Revolution. In 1798 it was bought by a merchant that demolished the building and sold the stone. The second Cambrai Cathedral had been build between 1698 to 1703. During the French Revolution it had been turned into a ‘Temple of Reason.’ Mary and Jesus where covered in cloth- hidden from sight- and the altar was covered with famous philosophers- they were to be the new icons. A torch of truth was set beside the altar. It was to be the new religion. As years passed the new religion made way for the old- the cloth hiding Mary and Jesus was removed. In 1841 the new Cambrai church was given the honour of being the Cambrai Cathedral. During World War One, the first battle of Cambrai was from November 20 1917 to 3 December 1917. The British were victorious in pushing back the Germans with the use of tanks, but a German counter attack forced the British to retreat. It is interesting to note that even though they had suffered 90% casualty in the battle of the Somme, the Newfoundland Regiment assisted the British in this battle. The picture I have is probably from the second battle of Cambrai. On October 8, 1918 the 2nd Canadian Division entered Cambrai and pushed the light German resistance back. On October 10, the 3rd Canadian Division entered a deserted Cambrai. Frederick Banting, the man who discovered insulin, was also wounded at this battle. 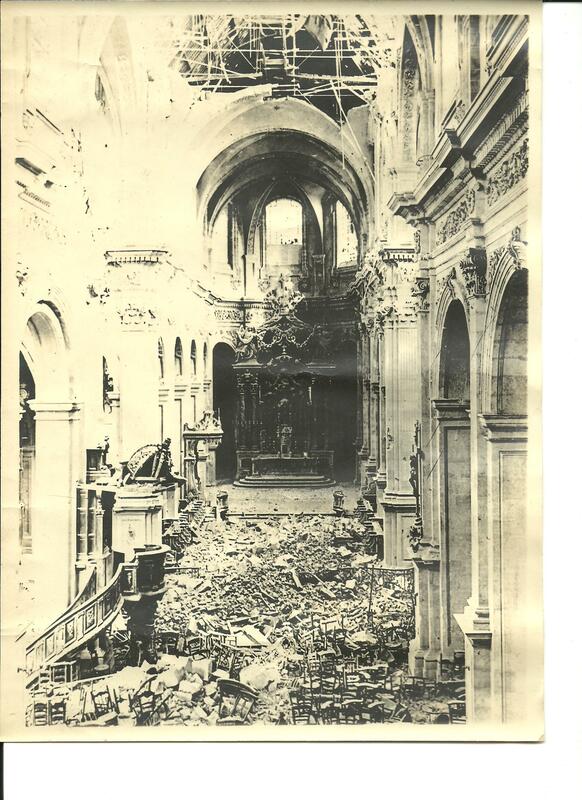 I found another picture on the Internet of the damaged Cathedral. Time has passed: most of the timber from the collapsed roof has been removed from the nave. Canadian soldiers face the apse in prayer, kneeling on the chairs that they rescued from the destruction. A priest is praying at the altar that once was dedicated to reason and truth. The caption reads that they are attending a Thanksgiving service. What were their prayers: memories of friends lost in the war; a wish for peace; or desire to return to loved ones? This entry was posted in Photo of the Day, politics, World War One and tagged Cambrai Cathedral, Canadian Regiment, Freanch Revolution, old photo, Thanksgiving, World War One. Bookmark the permalink.